The new product that uses millimeter wave technology that will not generate radiation to scan people thus eliminate the potential health and the liability issues that comes with x ray technology scanners. L3 communication offer fastest scanning solutions for explosives and drugs by quick scanning and pointing to any usually items that are hidden under clothing. 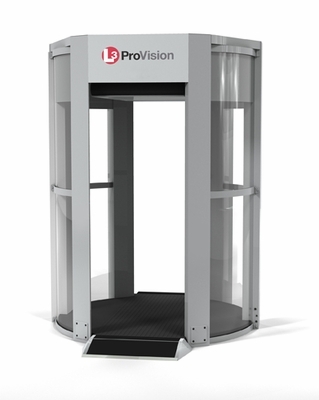 The ProVision™ Advanced Imaging Technology is designed for use at security checkpoints in airports, courthouses, correctional institutions, embassies and other facilities, the TSA-approved ProVision quickly screens subjects using safe active millimeter wave (MMW) radio frequency technology to detect concealed objects made of any type of material. TSA Approved: Qualified Advanced Imaging Technology (AIT) system. The new model of mass scanning provide automatic mode and do not use any detailed graphic images so privacy is not a concern with this new product. In the middle east and other region where privacy is a major concern such personal scanning devices could not be offered, however this new automatic Provision send a pass no pass signal without any graphic imaging .